Don't be "law people". I'm not even talking about lawyers, cops, judges and such- I am talking about normal, every day people who really have nothing to do with "laws", but who choose to worry about them anyway. Those are the people who hate something and think it's wrong because it's illegal. The ones who oppose Cannabis but not aspirin, due to the different ways the "law" treats the substances. "Law people" ask "Is that legal?" before doing something. 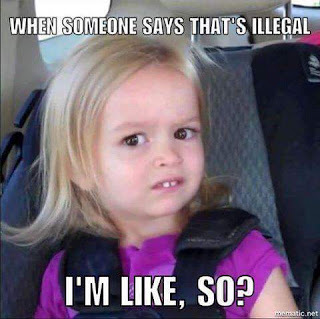 Or, say "But that's illegal!" when someone else starts to do something.